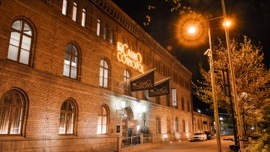 Following a tender process, TCS John Huxley has been selected to supply 30 e-FX Portrait displays to Casino Cosmopol, across the operator’s Sweden sites. This order endorses e-FX™ displays as an outright winner against its main competitors on all accounts regarding quality, reliability and price. The e-FX™ Portrait display is part of the world-renowned range of e-FX™ products. Available in single or double sided versions and utilising its entire screen, e-FX™ Portrait displays presents a spectacular and realistic winning number sequence. Highlighting key betting periods/messages (‘no more bets’, ‘good luck’ and ‘place your bets’) and winning numbers during active game play, its high impact animations attract and retain player attention in any venue. Available for Roulette, Sicbo or Money Wheel and with options to add LED trend/call lights on the side as well as 10” topper modules for a camera or additional screen, the e-FX™ Portrait provides the complete display solution for any casino.